Takeaways are an easy option after a long, hard day at work. But most takeaways are not very healthy and can be high in fat and salt. Have takeaways less than once a week. Salad bar sandwich or wrap – ask for wholemeal or grainy bread and choose some lean meat or chicken and plenty of salad. Sushi – choose rolls that contain salmon or fresh tuna, and vegetables or avocado. If it's available, ask for brown rice in your sushi. Avoid tempura, fried sushi and Japanese mayonnaise as these are high in fat. 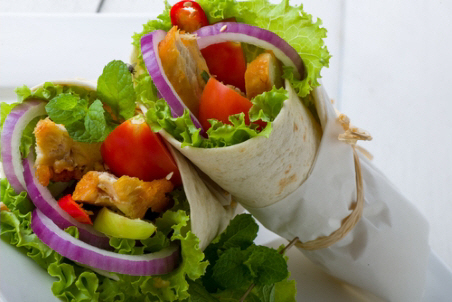 Kebabs – choose lean meats or the vegetarian option with lots of salad, rolled in pita bread with little or no dressing. Asian food – choose noodle or non-fried rice dishes with lean meat, chicken, fish or tofu, and plenty of vegetables. Burgers – ask for a wholemeal bun, plain grilled chicken, plenty of salad and no mayonnaise. Salads – on their own, leafy greens and salad vegetables won't fill you up. So make sure your salad has a protein-rich food such as lean meat, canned fish, hard-boiled egg, nuts, or beans such as kidney beans. Ask for balsamic or vinaigrette dressings. You can make alternatives to takeaways at home that are quicker and cost less than buying them. Fried chicken takeaways cost about $30 for a family meal. For just $15 you can get a cooked chicken and salad from the supermarket. For more tasty, quick and low-cost meal ideas from the supermarket see Supermarket = Super Takeaways from Community and Public Health. Try these Easy takeaway recipes from My Family Food for fast low-cost takeaway alternatives you can make at home. If you are going to have traditional takeaways, use the following tips to help you choose a healthier option. Have them less than once a week. Choose stir-fries with steamed rice, steamed fish or hot soups. Swap fried rice for steamed rice. Steer clear of deep-fried and sweet and sour dishes. Fish and chip shops vary. Look for those that serve grilled, crumbed fish and thick, straight fries. Ask for no salt or salt sachets instead of having salt put on your order. Stick to rice, dhal, and meat or fish cooked Tandoori-style. Curries that are tomato or yoghurt-based are also OK.
Avoid dishes with coconut cream, cream, ghee or anything deep-fried such as samosas, bhajis and pakoras. They tend to be high in unhealthy fats. Choose thin and crispy bases rather than thick or cheesy-filled types. Ditch the meat lovers pizza and go for a topping with vegetables. Don't have garlic bread as well. Have a salad instead. Order one pizza between four unless it's very small. Don't order an extra-large size unless there are a lot of people. Choose stir-fries with rice or chicken, beef salads or ingredients on grilled skewers. Keep away from fried finger foods and fried noodles. Also avoid dishes with coconut cream and peanut sauce. Sauces and dressings – avoid or go easy with these. Two tablespoons of a creamy dressing can have the same amount of fat and kilojoules as a small chocolate bar! Some sauces such as tomato and chilli sauce can be high in sugar and salt. Portion size – takeaway portions are often too big for one person. Try transferring the takeaways onto a normal sized plate. Then save any leftovers, or share one portion between two. Drinks – fizzy drinks, fruit drinks and flavoured milk are high in sugar. Have water or plain low-fat milk instead.